For over 100 years, the old barn at Blythedale Farm has been a focal point of the village of Cookeville, Vermont. A much newer barn houses the 40 or so Jersey cattle in their herd. 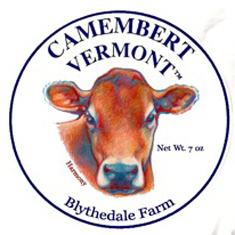 These cows supply all of the milk for Blythedale Farm’s Cheeses:Vermont Brie, Camembert Vermont, Green Mountain Gruyere, Cookeville Grana and Jersey Blue. They hand-ladles all their cheeses, using only whole milk. Their soft cheeses, Brie and Camembert, require a great deal of ‘hands on’ care and are considered the most difficult of cheeses to make. 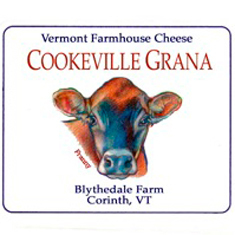 Their Green Mountain Gruyere and Cookeville Grana are small natural rind wheels made from unpasteurized milk. They are excellent grating cheeses and are a good additive in cooking; as well as having a lovely flavor that stands well alone. 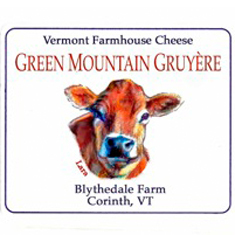 The Green Mountain Gruyere has been judged first in its class several times by the American Cheese Society. 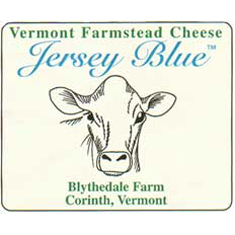 The Jersey Blueis made in the style of Stilton. Unlike other blues which are generally made from skimmed milk, the whole, unpasteurized milk makes a dense, creamy curd with a delightful flavor, which is enhanced by the Roquefort mold. The American Cheese Society’s annual cheese judging has judged Jersey Blue best in its class (Blue-Veined) and Reserve Grand Champion of the Entire Show! All of Blythedale Farm’s Cheeses are free from added animal enzymes and are made with a microbial rennet. Be assured that the cows who live at Blythedale Farm have a good home. They are cared for with love and respect and live in a clean, comfortable stable, with year round outdoor access. Their stress-free (and rBST-free, although law requires me to say that this makes no difference) lives create a milk with delicious flavor. Blythedale Farm’s products may be found in many markets, specialty cheese cases and on the cheese boards of finer restaurants. Because of the time consuming labor of farming and cheesemaking, Tom and Becky are not able to welcome visitors. 5 lb. wheel, natural rind, whole unprocessed milk, minimal salt is used which can hinder growth of blue flora but allows tremendous flavor development. Is often crumbly, but high butterfat content assures ‘melt in your mouth’ quality. 7 lb. wheel, natural rind, whole unprocessed milk. Excellent grating cheese to top everything – soups, salads, pasta, gratins etc. 7 lb. natural rind wheels, whole unprocessed milk, blend of cultures and bacteria produce rich, nutty flavor, excellent melting qualities. 7 oz. 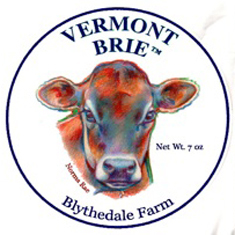 wheel, slowly pasteurized, whole milk, rind of mixed microflora develops traditional, old-style, French flavor. 7 oz. wheel, slowly pasteurized, whole milk, creamy mild soft cheese.